Please call owner Roman at 619-252-2391. Extremely clean, very low hours, turn key ready cruiser with factory galvanized trailer with tandem axles and brakes. 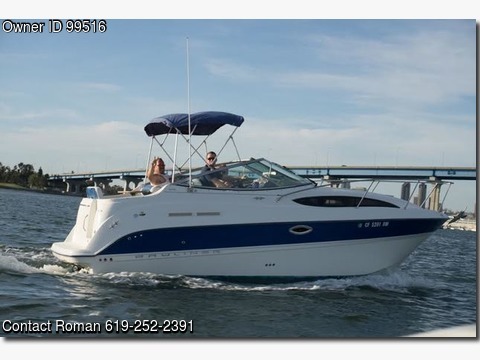 Boat comes with a standard MerCruiser 5.0-L Alpha I 220hp engine and trim tabs Deck area always cover, Bimini top, cockpit cover, all cushions like brand new, Stove and microwave never been used, upgrade package with battery charger, dual batteries, VHF radio, digital depth finder, illuminated compass, upgraded stereo with CD player, freshwater tank, hot and cold pressurized water system, waste holding tank single-burner alcohol/electric stove, dual voltage refrigerator, microwave, transom shower, bathroom with shower, shore power and cord, forward and side cruising curtains, carpet, Coast Guard pack, full gauges, hydraulic steering,a wood-grain package.Sleeps 6.